Martin Luther King Jr. addresses a crowd from the steps of the Lincoln Memorial, where he delivered his famous “I Have a Dream” speech, during the Aug. 28, 1963, march on Washington, D.C.
Martin Luther King Jr. had more than “a dream,” but you might not notice that on Monday during observances for his birthday. Somewhere between his assassination and today began an MLK-neutering campaign meant to turn the famed agitator’s holiday into a national Day of Service, a generic mishmash of good feelings that contorts King’s social-justice legacy into a blissful Hallmark card of post-racial nothingness. This has not gone unnoticed, from scholar Cornel West—who has pushed back against the “Santa Clausification” of King—to the #ReclaimMLK campaign, currently being spearheaded by young activists involved in the Black Lives Matter campaign. Many realize it’s time to stand up for what King actually stood for before his entire legacy is retconned into some “Chicken Soup for the Soul Brother,” feel-good tripe. Garza is part of the #ReclaimMLK campaign, which kicked off on King’s actual birthday, Jan. 15 and involves acts of civil disobedience—marches, sit-ins and shut-ins—through Jan. 19. Protesters want to use the holiday to call for action against police brutality while reiterating King's legacy as a leader dedicated to defending black lives. Garza said that organizers are using the day off that many workers get to call for a “day on” to fight injustice. “We really want to do everything that we can on this ‘Day of Service’ to lift up the needs and dreams of black lives,” Garza said. The work of this campaign is important, since MLK did not die because he wanted someone to paint a wall. While volunteering in and of itself is great and people should be encouraged to give back, it is not what got him killed. He was shot by an assassin for fighting against the racist, classist status quo, murdered while in Memphis, Tenn., to support striking black garbage workers. To make his birthday a day about giving back is to defang the legacy of a man who was both revered and reviled in his time for his tireless work confronting America’s sins. 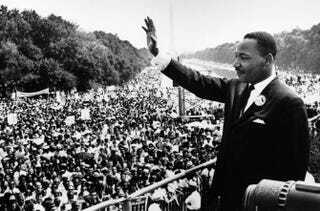 Calling out the ills of racism, capitalism and the Vietnam War didn’t involve any of the warm fuzzies that revisionists have assigned to King by solely focusing on the fantastical end of his famed speech at the March on Washington. Marshall Ganz, senior lecturer in public policy at Harvard’s John F. Kennedy School of Government, pointed out that while most people know about King’s “I Have a Dream” speech, they may not know that the bulk of the speech was about urging the Kennedy administration to act on protecting the rights of black citizens. The “they” Ganz is referring to are those “who benefit from the status quo.” He says that people who benefit from the way our society is structured like things the way they are and want to avoid controversy. Neutralizing King is more about “normalizing” a once-contentious situation to make it more palatable. In this case it involves shame surrounding the enforcement of racial segregation by violence and the disregard for African Americans’ citizenship. Ganz lauded the efforts of #ReclaimMLK, believing that it is necessary to “retrieve” MLK’s “prophetic past as opposed to that Santa Claus, that sanitized past.